Stencil1 is a USA based company created by Ed Roth, who resides in Brooklyn, NY. His designs are inspired by street art and the makers movement. He has created several stenciling books, which you should check out. Ed and I were chatting on Periscope while he was painting boots, using stencils from his company. 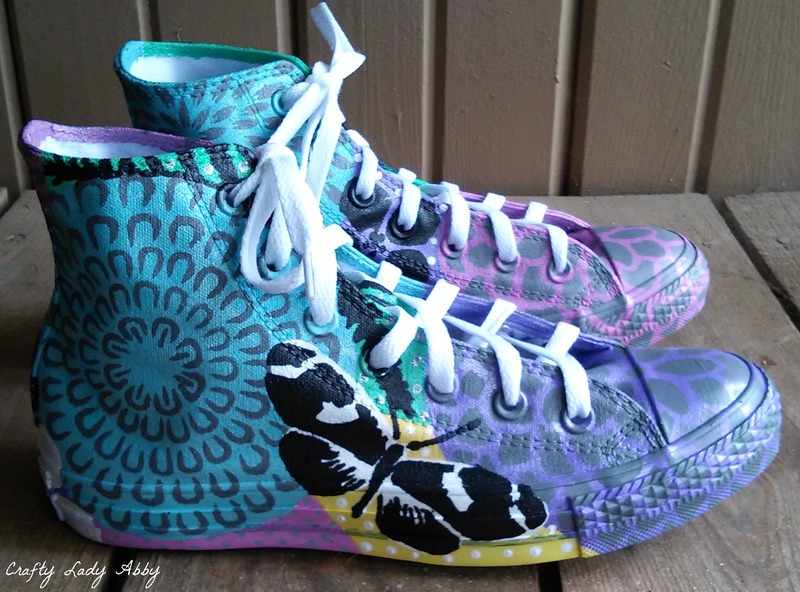 I've painted a few pairs of shoes, and a couple pairs of sneakers in the past. I enjoy making wearable art, which you all probably already know. 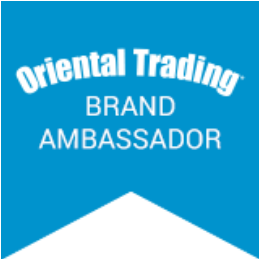 He reached out to me to partner on painting a pair of high top sneakers using his new Asian Mum stencil, and others of my choosing. I'll list them all in the supplies. I love working in layers, so I kept with that style for this sneaker makeover. My color choices are inspired by spring and contrasts. 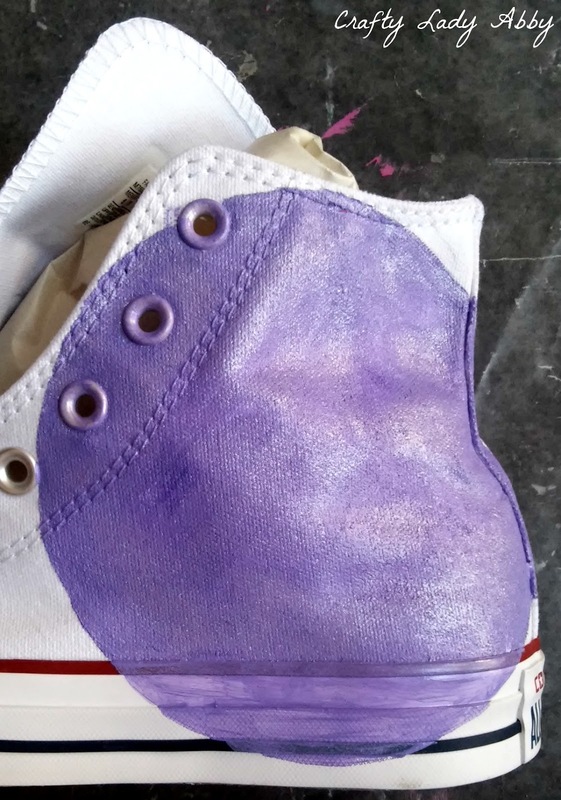 You can makeover your sneakers however you choose. 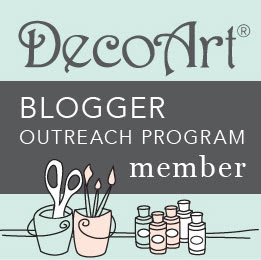 This tutorial will focus on layering stencils, designs, and colors. 1) Remove all the stencils from their packaging. Cut the butterfly stencils apart along the perforated lines. Remove the laces from the shoes, and place in the shoe box. 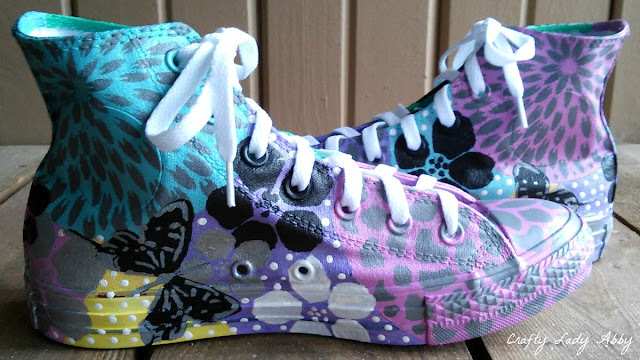 Stuff the shoes with newspaper, to make them more stable for painting. 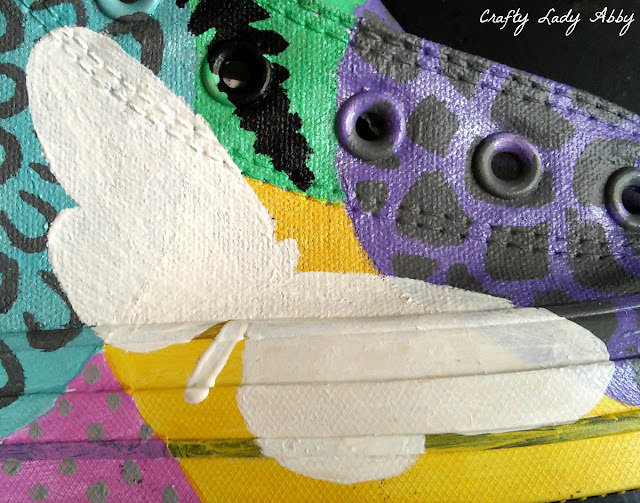 2) Lay the Asian Mum stencil on the outer side (this the side of your pinkie toe) of one sneaker, about center. 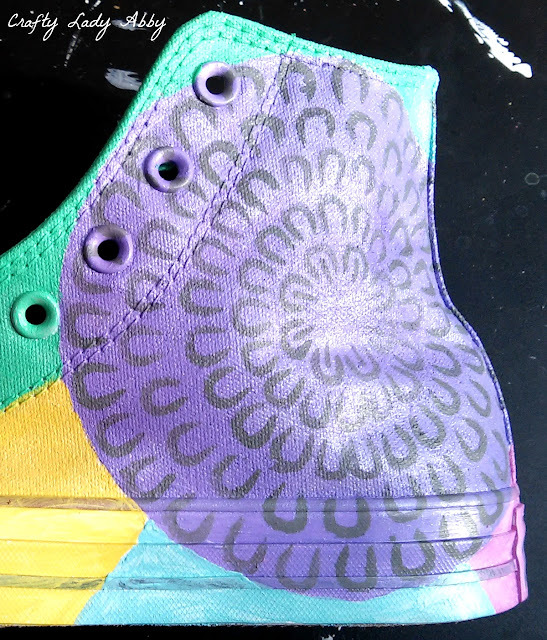 Part of the stencil will wrap around the sneaker back. With the math compass, measure from the center to a little beyond the edge of the stenciled design. This radius is about the same for each mum stencil, so I didn't readjust it. Remove the stencil. 3) Mark the stencil middle point on the sneaker, with a pencil. Place the sharp compass point on that mark. 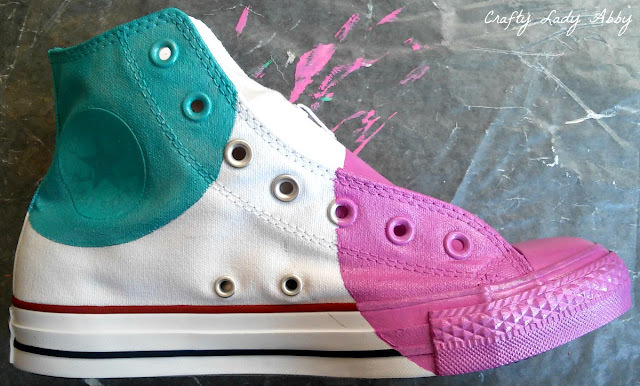 Turn the compass in a circle, lightly drawing a circle onto the sneaker. REPEAT STEPS 2 & 3 on the sneaker toe with the other stencils. The Exotic Mum stencil goes on the inner side (big toe side), intersecting with the Asian Mum, on the back. The Mum Stencil goes on the toe, and is the trickiest to place, as it needs to cross over the toe flap and both side pieces. 4) My paint colors are custom mixed to this formula 10 parts silver + 2 parts color + 2 parts white. Add more color or white as needed. The silver makes the color pearlescent. Mix and paint with one color at a time. 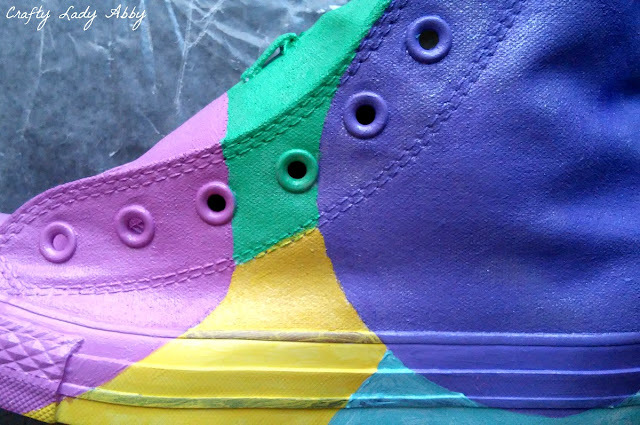 5) To precisely paint the shapes, use a small paintbrush for the edges, and a flat paintbrush to fill inside. My sneakers match in color use, but not placement, which was on purpose. The rubber needs multiple layers, to get an even coverage. Remember, there will be stencils over the base coating, so some imperfect will be covered. 6) On the inner side, there is a logo, which needed several coats of paint to be covered. Let each coat fully dry, before adding another. I had attempted to cover it with white paint first, but that didn't work. 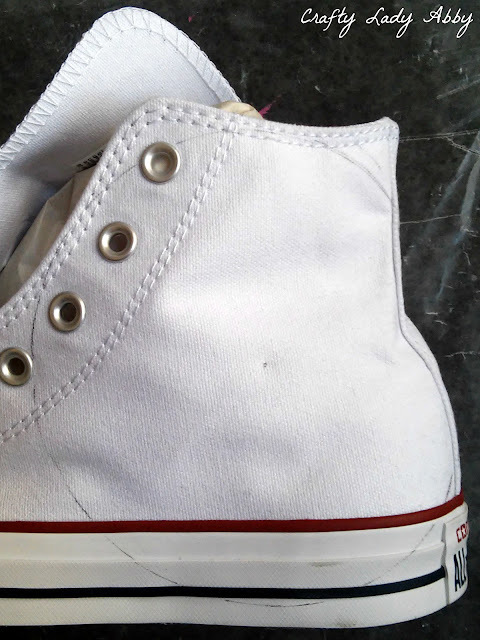 I also painted the eyelets, which took several coats. I don't expect this to last long term, but it's pretty for photos at least. 7) The toe area was the most difficult to map out with the compass, but I fixed any miscalculation later, in stenciling. The rubber needs multiple coats, to have an even opaque coverage. 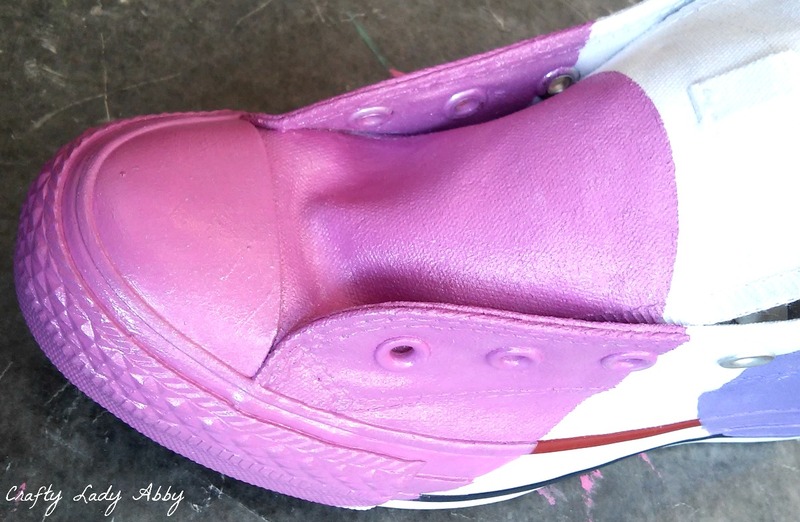 Make sure to paint the inside of the shoe, where shown, for a more seamless look when wearing the shoes. This is the only section that got the most inside coverage. Everywhere else is just around the top inner edge. 8) Fill in the remaining side sections with other colors for the blossoms and butterflies. The remaining tongue section is green, for the fern stencil. 9) Mix up some medium to light grey paint with 10 parts white to 1 part black. Add more of either if needed. Start with the two round sides. The outer side gets the Asian Mum stencil and inner is the Exotic Mum. I 1st tried taping the stencil in place, but found the painters tape didn't want to stick to the painted fabric. Instead, I worked carefully in sections. To stencil, lightly dip the small stiff stencil brush into the grey paint. Tap off excess onto a clean section of the plate, or on a paper towel. Too much paint, can cause the paint to seep under the stencil. If you work in sections, and remove the stencil, let the paint completely dry and clean paint off the stencil, before laying the stencil back onto the work. 10) The toe is the trickiest part. 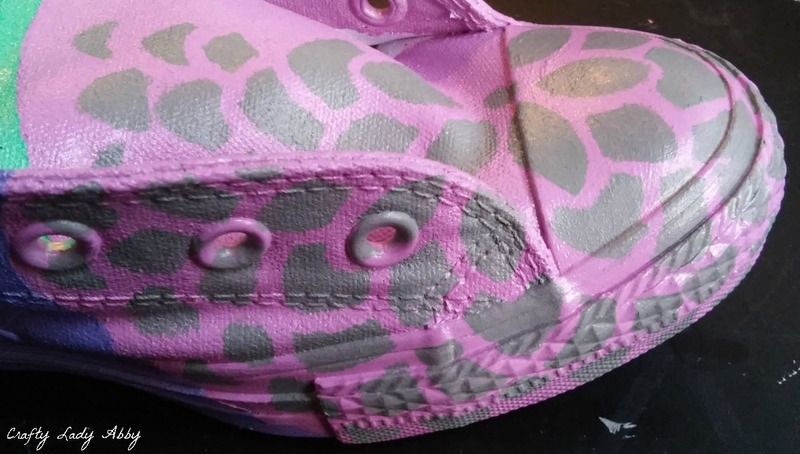 I had to work in sections with the Mum Stencil, since the tongue area is tight, and the toe curves a lot. I found it easiest to do the sections separately...tongue, toe, and sides. To get fill in small section that the flat stencil didn't cover, I used small shapes on the stencil, to create a cohesive stenciling appearance. 11) The tongue top was the easiest front section to stencil, since it's flat here. I used the grey paint and Exotic Mums stencil, for the remaining circle edge. For the fern stencil, I used black. I wanted to keep the concept of layered patterns through the whole sneaker. 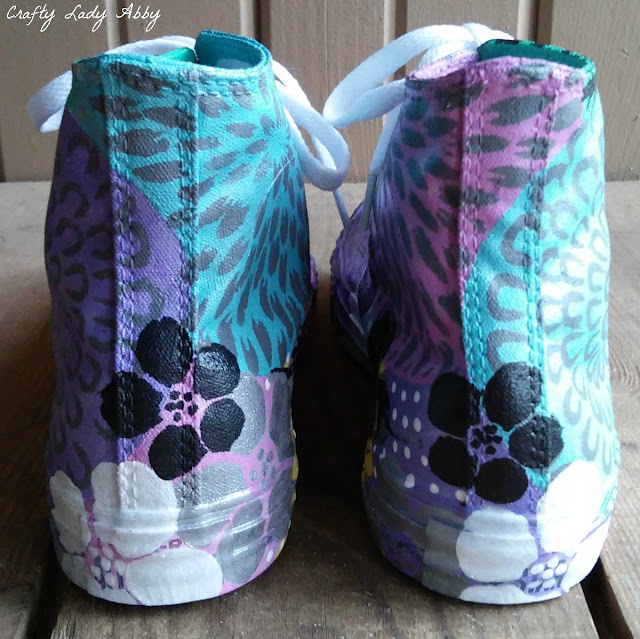 To fill in the negative space, I dipped the brush handle end into silver paint, and onto the sneaker fabric, to create polka dots. 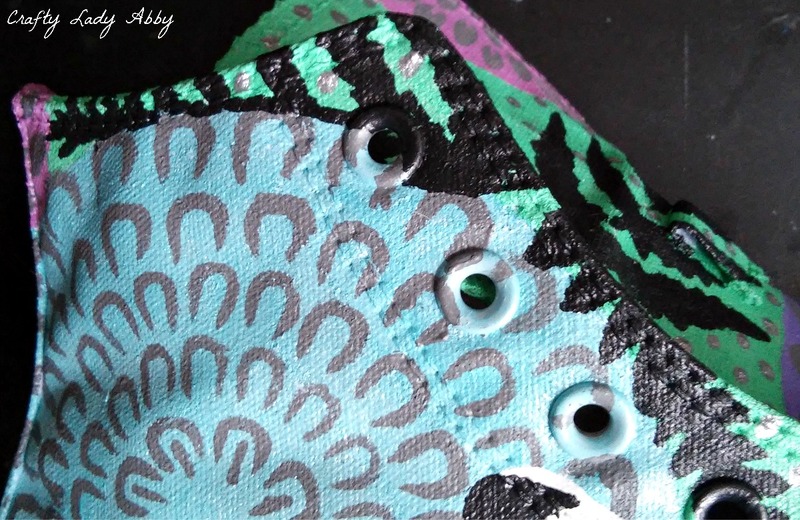 This is a little tedious, as you need to dip into the paint for each dot, but they add pattern and sparkle easily. 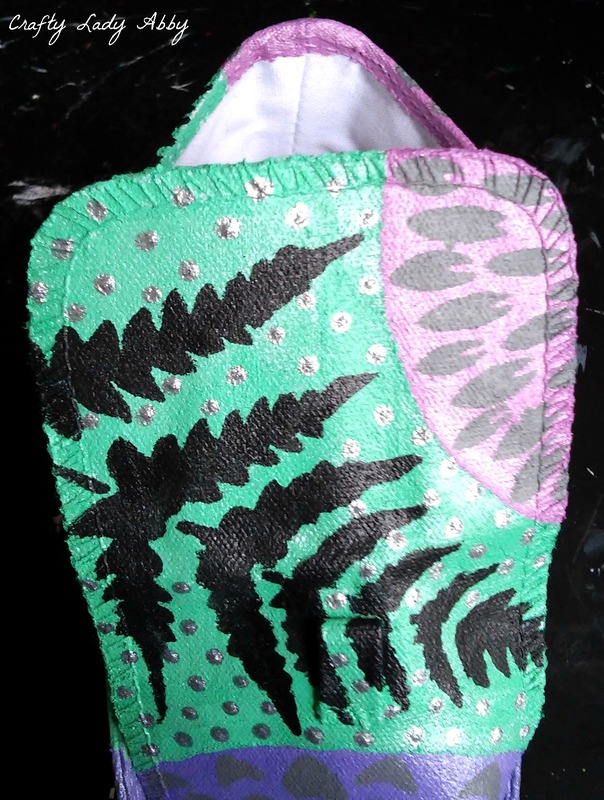 12) Continue the fern stencil and dots along the si8de green section. I shifted the stencil flow, to extend it onto this section. It gives a cohesive look, in the end. 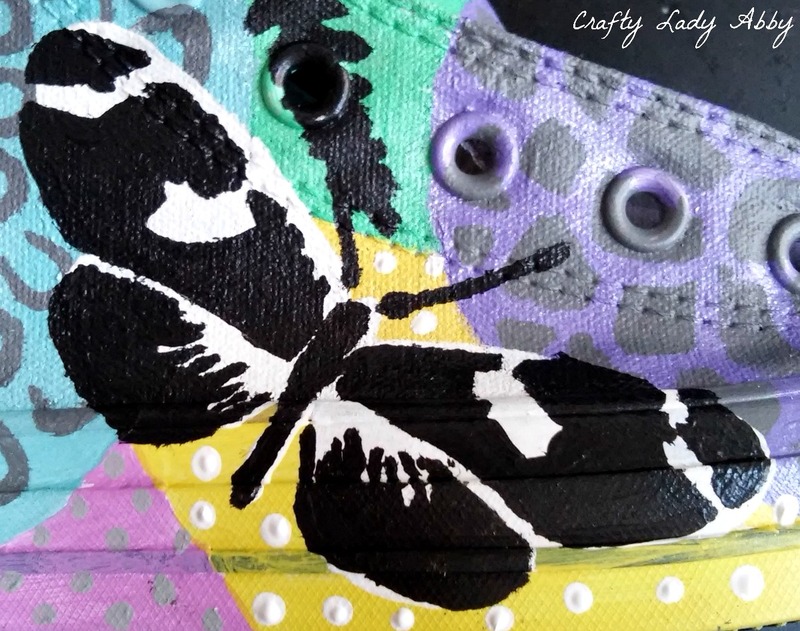 13) For the outer non-stenciled section, I used the largest 2 part butterfly stencils. I stenciled it with white paint. Then, went back over it with white paint and a small paint brush. Let this layer completely dry. 14) Place the 2nd part onto the white butterfly. I offset it on purpose, but it does perfectly align, if desired. I filled in the negative space with more polka dots, in white and grey. 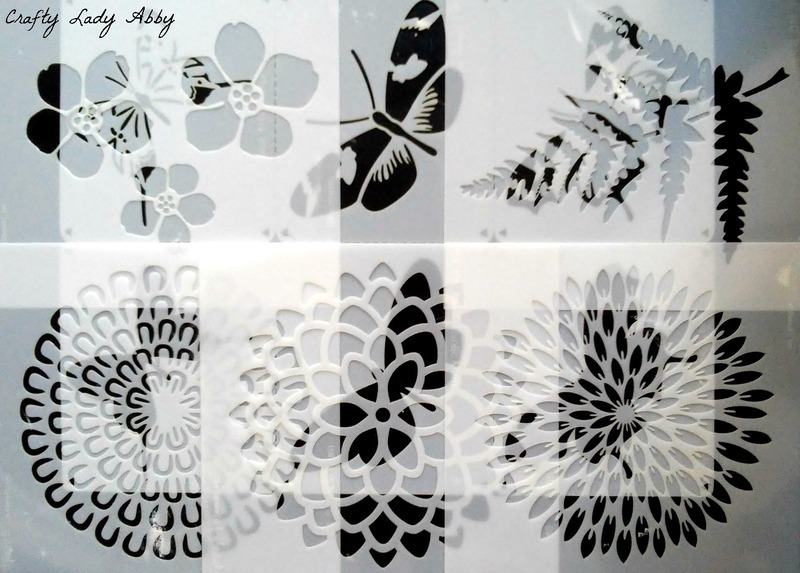 15) For the remaining non-stenciled sections, I layered individual blossoms, and two of the three butterflies. Let the paint dry completely, in between layers. I started with the white blossom, added the black blossom, and then a grey blossom. I went back over them with a small paint brush, for more opacity. To add sparkle, I used clear glitter fabric paint on the white and black blossom. Later, I changed my mind, and repainted the black blossom, black, to cover the glitter, The grey blossom has silver paint. I stenciled the medium butterfly part 1 black. Then, stenciled the 2nd part grey. I went back over it with a small paint brush and silver paint. For the 2nd sneaker, I didn't add the silver. 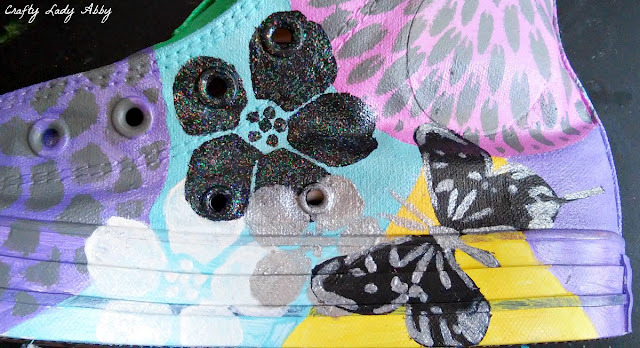 16) I continued the overlapping blossoms around the shoe back. I filled in the remaining negative space with white polka dots. 17) Let all the paint dry. Seal the painted sneakers with a spray or paint on clear sealer, to make the paint last longer on the rubber sections. Let the sealer cure completely before touching again. 18) Remove the paper from inside the sneakers. Re-lace the sneakers. 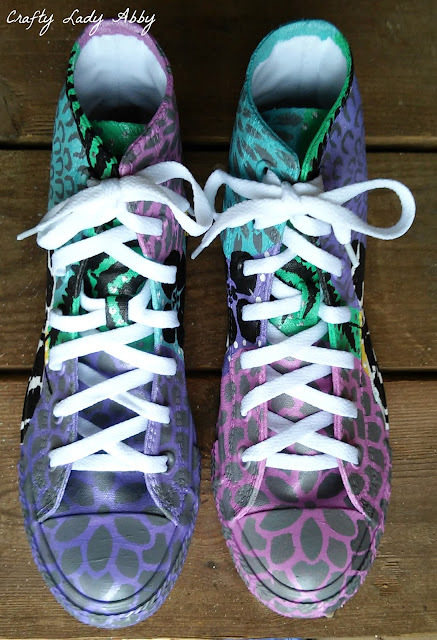 More of my shoe makeovers can be found here. I have more planned, because Spring is always a good time for a wardrobe refresh. I'm working on refining my artistic style, focusing on bright colors and contrasts, with nature and abstract elements. These sneakers reflect that style. These are great the wear for teaching, demos, and casual networking, where I want my creative brand to flow from my clothing and jewelry, to my feet. When picking out shoes to paint, look for natural fabrics in white or cream. White provides a great base for bright colors to stand out. Natural fabrics accept fabric paint well. Cotton is the best, as colors won't easily bleed, unlike silks or satins. Canvas is a stiff fabric, and is commonly used for footwear, bags, and artist canvases. 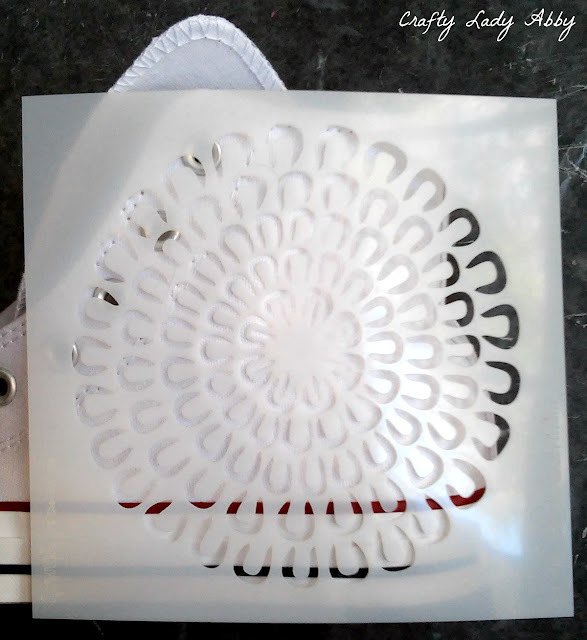 Stencil1 has a large variety of stencils to choose from. If you want to tweek this project to your design style, check out the available stencils and stamps on Stencil1. Happy Makery!